Shelties are agile and athletic. Any excess weight they carry prevents them from taking full advantage of their athletic abilities, and because of the coat thickness, you may not notice your Sheltie is overweight until it’s a serious issue. You may know them best as a Sheltie, and this smaller version of the Collie is a quick and intelligent, fun loving and loyal family dog with a sweet temperament and plenty of energy. They’re excellent herding dogs and do well with a large yard or when there’s a job to do. They have plenty of positive traits being sensitive dogs who can really read the mood of the room. They’re easy to train and eager to learn all the new tricks. Any food you give this breed should be able to keep up with their energetic nature and help keep the skin and coat healthy. Foods with empty calories and fillers are most likely to cause excess weight gain and trigger allergic reactions that can make the skin and coat dull and patchy. Providing excellent quality nutrition helps you maintain your Sheltie’s weight and stave off any issues with that glorious coat. 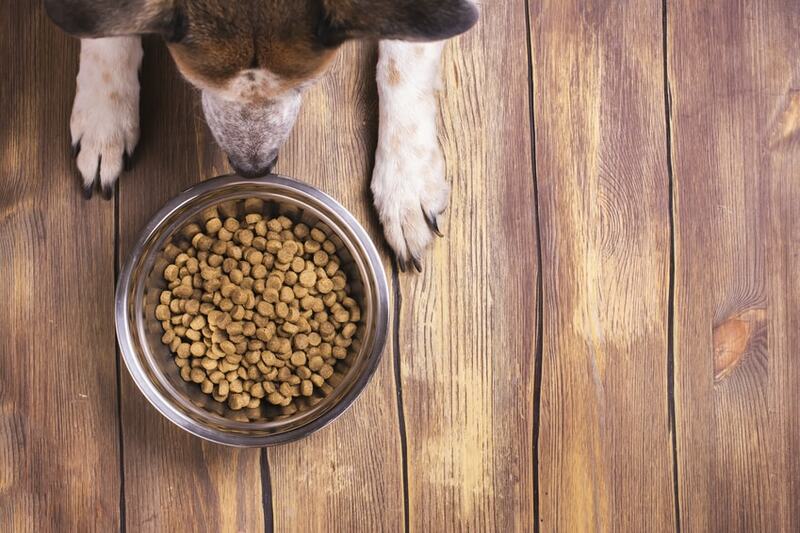 Let’s take a look at what it’s going to take to feed your Sheltie the right way. Shelties are generally healthy dogs, but there are a few conditions you should watch for. Many of them can be avoided or alleviated by using a quality, densely nutritious food that maintains weight and provides the proper building blocks for overall good health. Let’s take a look at a few things that could become issues at some point in your Sheltie’s life. Athletic breeds are often at risk for joint issues, and Shelties are no different. This is a genetic deformity that causes the hip joint to form incorrectly, which makes it more likely to pop out of socket over time. While diet can’t cure the condition, it can help control weight and build healthy muscle tone, which could alleviate the effects. Shelties have complicated coats, and some are prone to severe skin issues. Foods that contain common fillers are likely to make these allergies worse. Look for foods without allergens like corn, soy, and gluten, and that have support for skin and coat health. Essential fatty acids plus antioxidants from fruits and veggies are great places to start as are limited ingredient formulas. Again, this is a genetic issue, but diet can play a part in how severe symptoms are. Foods that contain fillers stress the thyroid by increasing weight and spiking blood sugar. Densely nutritious foods reduce the load on the thyroid, and there’s some evidence that going gluten-free can further support better thyroid function. The first ingredient should be a complete protein from a whole source, never a by-product meal. Quality proteins maintain muscle tone and help keep weight at the right level. Combine this with a quality complex carbohydrate and your Sheltie can maintain energy all day without adding extra pounds. Whole fruits and veggies give your Sheltie vitamins and antioxidants which support immune function, digestion, and skin health. Essential fatty acids help keep even the most sensitive skin happy, and glucosamine and chondroitin support joint condition. For really sensitive Shelties, a limited ingredient diet can help alleviate those allergic responses that cause their coats to shed unnecessarily and skin to become inflamed. They can also help support digestion if your Sheltie is prone to loose stools. Corn and soy are two ingredients often used to reduce the overall cost of the food. These ingredients might make your wallet feel good now, but later when you’re scheduling more than average vet appointments for issues related to your Sheltie’s diet, you may not be so pleased. These empty fillers, along with by-product meals, artificial colors, and artificial flavors, can wreak havoc on your Sheltie’s digestion, skin health, and weight. It’s best to avoid all of them and choose foods that use none of these ingredients at all in the formula. One particular concern with gluten and grain free diets is the prevalence of potatoes, peas, and legumes. These ingredients have been tentatively linked to a condition known as Canine Dilated Cardiomyopathy or an enlarged heart. We aren’t sure of exactly what’s causing the link yet, but just to be safe, speak with your vet and try to avoid foods that list those ingredients in the first three positions. Although many brands prioritize price over nutrition, there are three which we see repeatedly in recalls with red-flagged ingredients sitting prominently on the shelves. If you want to give your Sheltie the best nutrition available, we recommend running from the following brands. Kibbles N Bits: Sure, it may be a dynasty at this point, but Kibbles and Bits uses every single ingredient we told you to avoid. It’s cheap, low quality, and full of empty calories. Alpo: The picture on the front may be of a healthy, athletic dog, but the food inside is anything but healthy. It uses lower quality ingredients, corn and soy for the few dry options, and has been recalled more times than we can count. Ol Roy: The Walmart brand famous for large bag sizes and tiny price tags has the nutrition to match that price tag. It’s low on quality ingredients and high on fillers. Plus, the kibble is hard and difficult to chew for mouths with smaller teeth and jawbones. Skip it. Shelties need quality nutrition to maintain weight, and it’s vital you keep an eye on their consumption. Your vet is the best resource for specific feeding amounts and plans, but here’s an idea of what to expect. Puppies: Sheltie pups should have care when consuming calories because you don’t want to cause weight gain too fast. Your vet will probably change feeding recommendations rapidly through their quick maturation period. Adults: Most Shelties will receive between 3/4 and 2 cups of food per day depending on activity level and recommended serving sizes for the specific food you choose. Seniors: Sheltie seniors will have similar feeding recommendations as their younger counterparts, but your vet may alter amounts based on activity level and weight gain. Your Sheltie needs food that can keep up with its natural curiosity and athleticism. Good protein sources and complex carbohydrates support muscle and energy while things like fatty acids can help keep skin happy. If your Sheltie is like many of this breed, you may be better off with a limited ingredient diet to help keep allergies and skin inflammation under control. Zignature’s limited ingredient food cuts out all the common food allergens and uses a single protein source to help with digestion. It’s grain free with no cheap fillers and contains fatty acids, vitamins, and antioxidants to support the skin, immune system, and brain health. It’s an excellent recipe for supplying your Sheltie everything it needs for a lifetime of health. Zignature uses a holistic approach to nutrition that cuts out all the unnecessary parts to help your Sheltie digest better. Foods contain top quality ingredients in nutrient dense formulas. Recipes are created in South Dakota and Michigan based kitchens and consider both canine health and environmental impact. Natural Balance is a highly affordable food with a limited ingredient formula to help promote healthy digestion and skin health. It uses a single protein source plus vitamins and fatty acids to improve the condition of the skin. Fiber supports healthy digestion, and the recipe contains no fillers or common food allergens. Natural Balance’s recipes are designed to alleviate allergy suffering and promote good health in sensitive dogs. The company creates recipes and tests them extensively for sensitivities, so you can get back to your best life with your best friend. NomNomNow’s Heartland Beef Mash is a cooked formula that uses human grade ingredient with no cheap fillers. It mimics the ancestral diet of your Sheltie’s canine ancestors without the hassle and mess of a raw diet. There’s support for skin, coat, and the immune system through whole fruits and veggies plus NomNomNow’s nutrient blend. NomNomNow uses only high quality, human grade ingredients in recipes created by a veterinarian. Meals are cooked in the company’s kitchens and delivered right to your door ready to serve or refrigerate. It’s an excellent middle ground between a traditional kibble and a raw food diet. Puppies change rapidly over the course of their maturation, so your vet will probably change recommendations several times. Sheltie puppies need support for their powerful personalities and shouldn’t be allowed to gain too much weight too quickly. Wellness Core is a grain-free recipe that encourages proper growth rates and strong, healthy muscles. It has support for developing brains with DHA, which also helps support the skin. It also has guaranteed calcium and phosphorus levels to help your Sheltie’s bones grow correctly. Wellness uses holistic nutrition to support growing puppies even when they have sensitive tummies. Premium ingredients form the basis of all recipes, giving puppies a head start for lifelong health. Nulo’s wet foods are good for picky puppies or to help puppies who’ve just weaned. The formula uses turkey and cod as the building blocks for healthy growth plus sweet potato for all-day energy. It’s grain free and contains DHA for skin and brain health, and it’s low glycemic to help control growth. Nulo’s mission is densely nutritious food without cheap fillers. Their puppy foods help your Sheltie grow properly without putting stress on the bone structure. The company uses premium ingredients for recipes created in test kitchens and should give your puppy the building blocks for lifelong health and wellbeing. Senior Shelties usually receive similar portions as they did when they were younger, but your vet may alter those portions if your Sheltie is having trouble keeping pounds away. Foods that help control weight while still providing protein for muscle tone are critical. Now Fresh’s weight control formula packs a lot of dense nutrition into food while cutting overall calories. It uses a whole protein source and nixes grains to help your Sheltie feel full and full of energy all day. It includes glucosamine and chondroitin to support aging joints while essential fatty acids help keep your Sheltie’s brain sharp and skin soft. Now Fresh’s recipes are created to help your senior make the most of its golden years with plenty of protein and supplements to help with joints and skin. It features a complete omnivore’s recipe that mimics what your Sheltie might have eaten before being domesticated and offers dense nutrition to support that athletic personality. Blue Buffalo’s life protection formula helps keep seniors fit and ready to go. It uses patented LifeSource bit to provide critical vitamins and minerals while whole protein sources keep up muscle tone. It has glucosamine and chondroitin to help keep joints healthy, and fatty acids are perfect maintain brain health and keeping the skin inflammation-free. Blue Buffalo started out of love for a sweet Airedale Terrier, Blue, and has expanded to include premium dog food recipes for a range of pets. Their senior formula gives your Sheltie all the best sources of nutrition so you can enjoy each other right up to the very end. Your Shetland Sheepdog is an energetic, life-loving companion full of curiosity and loyalty. Support that energy and athleticism with the right type of foods and you should be able to enjoy your companion’s antics for many, many years. Foods that provide plenty of quality protein plus complex carbohydrates for energy throughout the day are great, but you may have to switch to limited ingredient formulas if your Sheltie develops allergies. Making sure there’s a single protein source and no cheap fillers can help alleviate skin issues and digestion difficulty. Whatever you do, make sure that your Sheltie maintains a proper weight because even an extra few pounds can be devastating for your Sheltie’s bones and joints. Healthy weights encourage your Sheltie to remain active throughout its life and give your furry companion a head start in the senior years with better muscle tone and more protected joints. A quality companion deserves quality food, so deliver it and reap the benefits.